As many of you know, travelling is firmly on our family agenda. It’s something that we don’t do nearly enough of, mostly due to finances, but also in part because travelling with young children seems daunting. So when Kirsty asked if she could write a guest post for me detailing her tips, I jumped at the chance to read more and to share them with you all. Thank you Kirsty! I’ve always been a big fan of travelling, but now I’m expecting my first baby, I’m a little worried about how I am going to manage my love of adventure, with the stresses of being a parent to little humans! I know Jo has been thinking about taking her boys on an aeroplane soon, the ultimate adventure for little ones, so I’ve been looking at ways to make travelling with a young family as stress-free as possible. Boredom is the easiest way to bring on a tantrum, so be prepared! 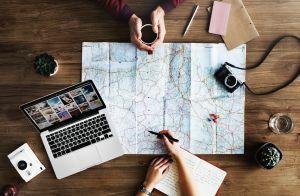 Bring along some home comforts, such as favourite toys and comforters, but then also arm yourself with some cheap but new and exciting things to bring out, especially while doing the actual travelling. Don’t give up everything at once, and try to choose stuff that isn’t going to be too messy or disruptive to other passengers. Children seem to have an uncanny ability to always be hungry just as you pass somewhere very overpriced! This is especially true on the plane, so it pays to keep plenty of delicious snacks with you at all times. Load up on granola bars on your carry-ons to save a whole lot of money and stress later on the plane. Although a big part of a holiday is spending time together, it’s also beneficial to spend some time apart and give everyone a break. Let your children spend some time in the kids’ club, making new friends, or perhaps take just one of the children to see something you would both enjoy, while Dad and the other children go and see something that suits them — rather than everyone being dragged around somewhere they won’t enjoy. 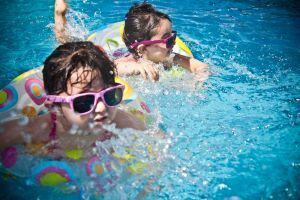 Even from a young age it’s important to teach your children about sun safety, and how important it is to make sure you are applying (and regularly reapplying) sunscreen, covering up or staying in the shade. They also need help to remember to stay hydrated, drinking plenty of water, especially on a hot day, but avoid tap water and opt for bottled instead where possible. In 2018, when we have cameras on our phones, there is no excuse not to capture every moment. However, make this extra fun for kids by getting them to fill in a journal, or write postcards back home. They will enjoy collecting tickets from attractions, decorating pages of a scrapbook and having a project to do. If they are only small you might have to help with the writing but this is a good wind-down activity of an evening and something lovely to look back on. 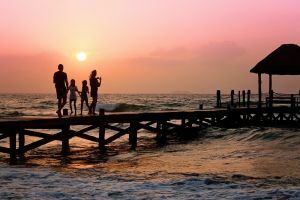 Children will get so much out of travelling at a young age and as a family you will make amazing memories to last a lifetime. Don’t let the stress put you off! Let me know in the comments if you have any other tips for families travelling with young children?